Holsteins was a place that we had high hopes for. After hearing some good things and looking over what looked like a great menu, we were excited to try some of their signature burgers and shakes. It’s also located inside the Cosmopolitan hotel – home of ‘The Wicked Spoon’, one of our favourite brunch spots in Vegas (all you can eat and bottomless drinks between 8am-12pm! for $36! 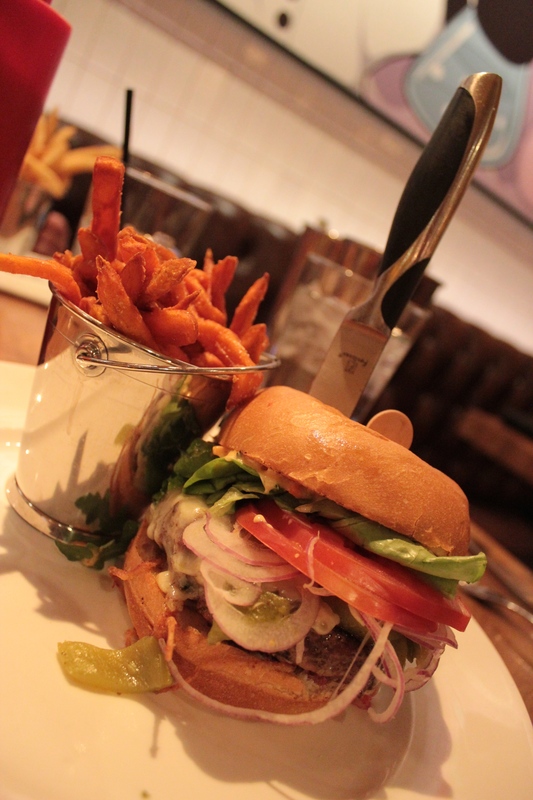 ), so we were all set for yet another great burger. Unfortunately, this was the first disappointing burger of our Las Vegas adventure. 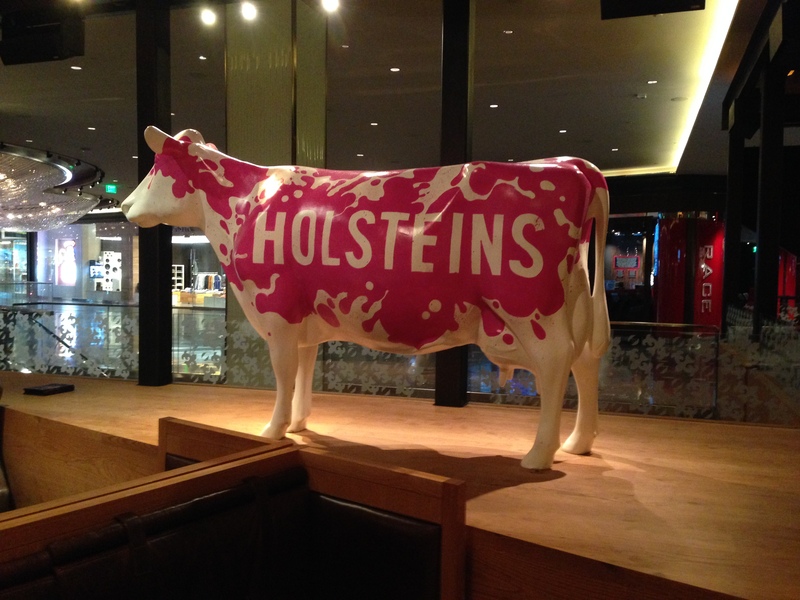 Inside, Holsteins is a fairly nice looking restaurant. It’s fairly small and decked out with large wooden tables and leather booths. Despite the large range of booze-filled milkshakes and cocktails on offer, it feels very much like a family restaurant inside. We’d walked past it a couple of times prior to our visit and it appeared very busy but when we visited, we managed to get a table straight away – around 3-3:30pm. The menu at Holsteins is fairly large. There’s a lot to choose from and a whole host of drinks to wash everything down with. We opted for the he ‘El Machete’ burger, which consists of a beef patty topped with fire roasted Anaheim chili, borracho onions, pepperjack cheese, lettuce, tomato, onion & spicy ‘Machete’ aioli on a lightly toasted bun. We also opted for the sweet potato fries too. 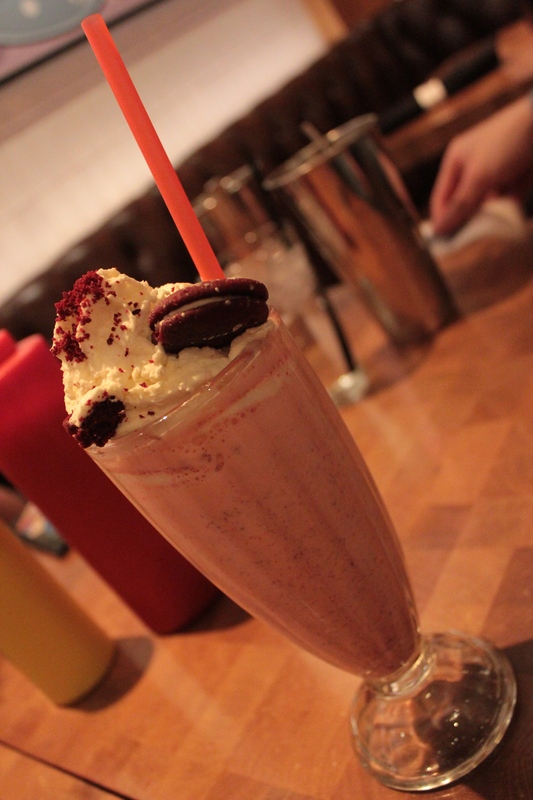 To get a better idea of what the Holsteins experience had to offer, we also ordered a couple of alcoholic red velvet cake shakes. The meat was cooked perfectly, medium-rare as requested – however, it simply lacked flavour. It was juicy, but there was a definite lack of seasoning which let the whole thing down tremendously. As you can see from the photos, there was also way too much salad on the bun. It wasn’t Berlin Burger International levels of ridiculous, but it was still far too much. As I picked up the burger, salad began to fall out all over the plate and it overshadowed nearly everything else in the bun. If you scroll back up and re-read the description of the burger, it reads like it should certainly deliver on taste – but for a burger containing such big, bold flavours it was all a bit….well, bland. This was particularly dissappointing because of how well the patty was cooked. I was expecting some kind of kick, given the chillies, aioli etc but there was no heat whatsoever here. 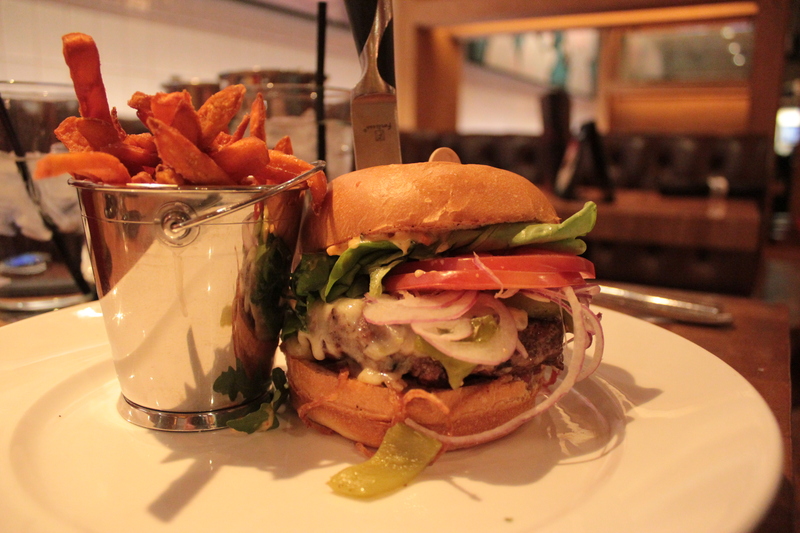 The bun itself was great – light, fresh and slightly toasted. It was soft, but held everything together well – aside from the stupid amount of salad that spilled out of the sides, of course. The sweet potato fries were decent enough, but could have been a bit crispier. By comparison, the sweet potato fries served as Stripburger are much better and probably the best I’ve ever eaten – not just in Las Vegas. As a side note, alcoholic Red Velvet shake, consisting of red velvet vodka, red velvet cake, cream cheese mousse and a mini whoopee pie, was fantastic and the added alcohol certainly didn’t hurt either! 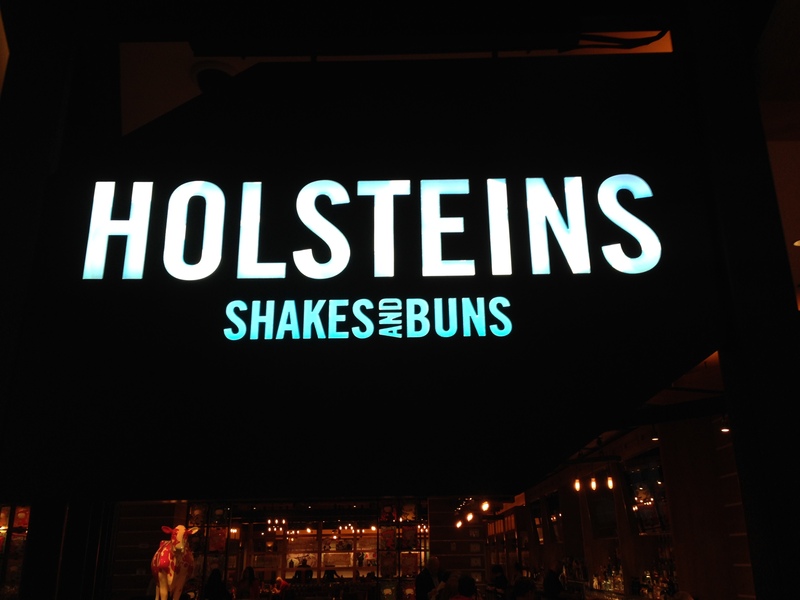 Holsteins certainly has potential and I don’t doubt that they often serve excellent burgers. As mentioned, the ‘El Machete’ was perfectly-cooked but lacked any real flavour or seasoning and was overpowered by a silly amount of salad on the bun. For the price, you’ll find much better on the Strip. + Decent sweet potato fries, but not the best in Vegas.